Pump up your dinner “fun factor” for kids of all ages with our Walking Tacos! It’s a party in a bag and the most fun way to eat tacos on the go! 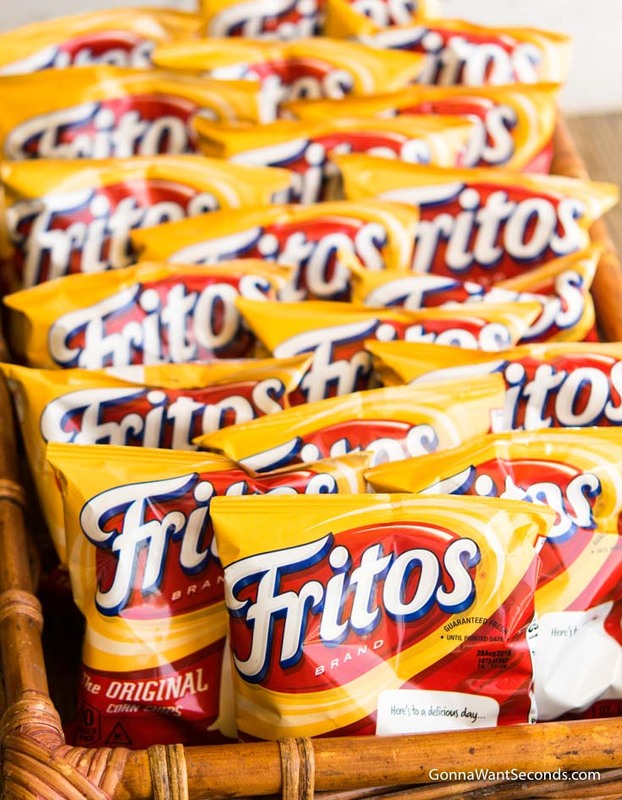 Who doesn’t like to munch dinner out of a Frito bag? And who doesn’t enjoy minimal prep work and next to no cleanup? Walking tacos use premade chili and involve zero dinner plates, which means a quick and clean mealtime for you. The natural next life of leftover Texas Chili or Turkey Chili, walking tacos help you cut back on waste and forgotten freezer treasures. Named for their transportability and popularized by their palatability, walking tacos (aka traveling tacos) is a memorable meal for the family fun night—a cool option for Taco Tuesday. Make walking tacos for 50, heck, make walking tacos for 100 just follow this no-fuss recipe. 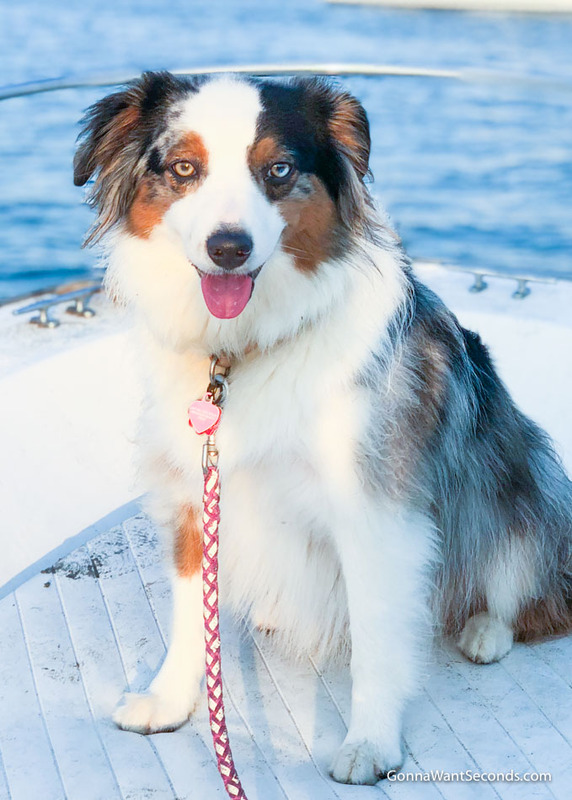 Eager to learn more about various ways to make this enjoyable dinner fare? Treat this walking taco recipe as your walking taco wiki, a go-to source for all the taco information you have ever wanted to know but were afraid to ask. It’s a perfect use for leftover chili. Walking tacos easily feed a crowd. It’s a fantastic alternative to Taco Tuesdays. 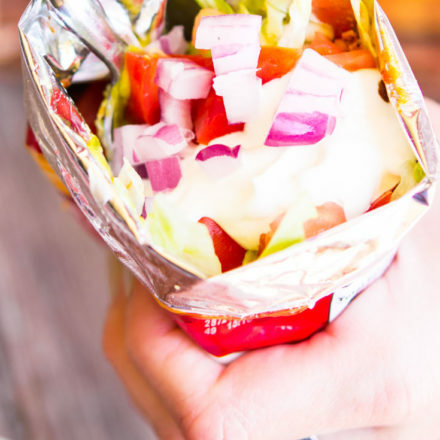 Walking tacos are great for camping, picnics, and outdoor adventures. It offers the easiest clean up a cook could ask for! Zero plates required. Your diners can personalize their ingredients according to their taste and dietary needs. While the walking taco definition varies slightly depending on whom you ask, in short, it is a self-contained and portable taco meal! Take your walking tacos camping, make a walking taco concession stand—name your portable food need, and walking tacos can cover it. Texas style chili is the original and authentic chili to serve in walking tacos, but there are many other fine options. Keep reading for some variations. 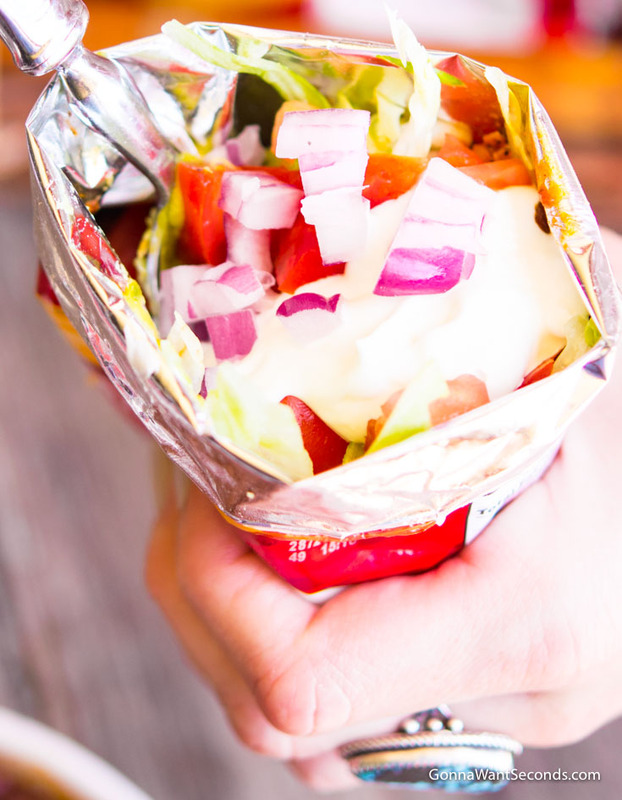 The foundation of walking tacos is some sort of chili—Texas, turkey, or canned. In addition to chili, you will need Frito chips and taco toppings like cheese, lettuce, onion, and avocado. Walking tacos are a breeze to put together. 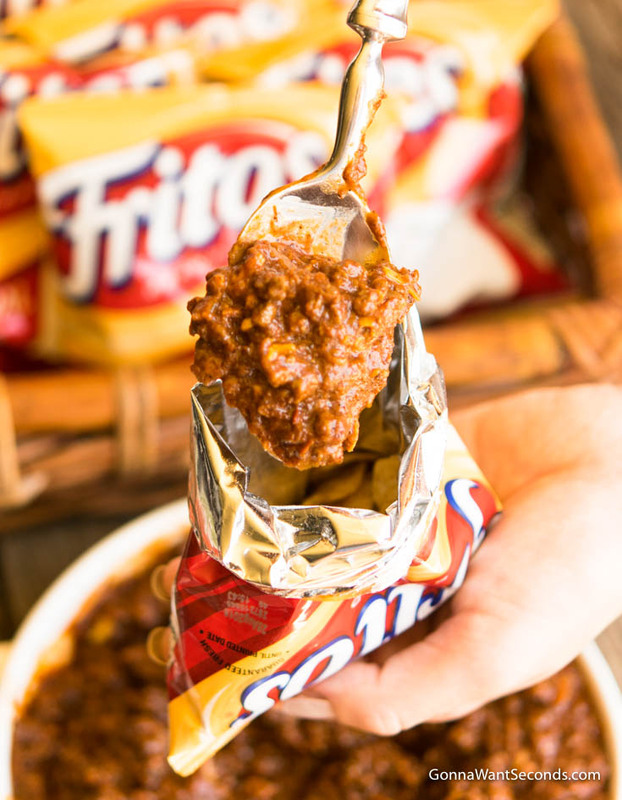 Crunch up a snack sized bag of Fritos, pour in ready-made chili, top with your favorite toppings, and dinner is done. 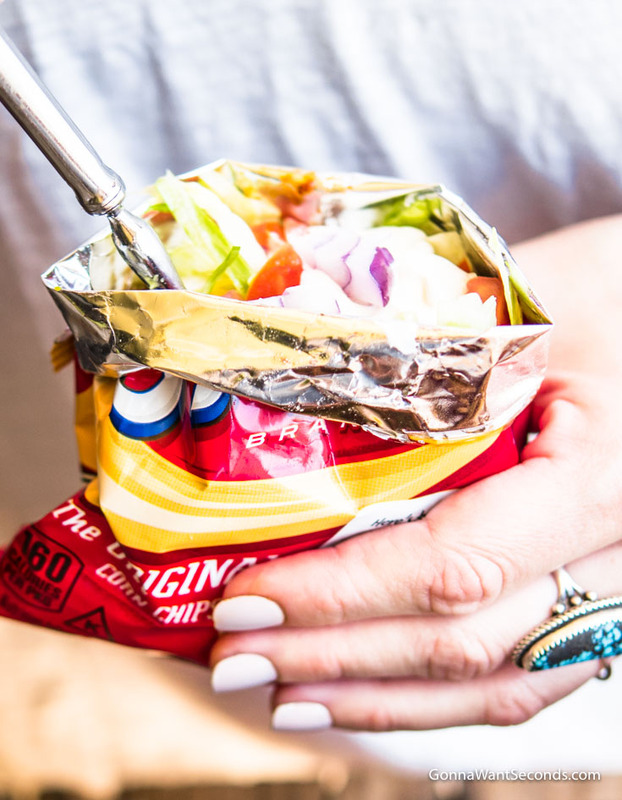 You can open the chip bag from the top or cut it open from the side; either way works for walking tacos. Set up and clean up only take a couple minutes since the chili is pre-made, and the dinner “plates” are single use. Pump up your dinner “fun factor” for kids of all ages with our Walking Tacos! Make them for 50 or even walking tacos for 100 by following this no-fuss recipe. Have chili ready and warm. Prepare all your toppings and set up to have ready to serve. With the bags of Fritos closed crush the chips then open the bag. Spoon in chili then allow everyone to top with their favorite toppings. Grab a fork and enjoy! Shredding lettuce: Tear with your hands or cut with a knife to shred lettuce, but another option is (well-washed) scissors! Many people don’t think of this common implement as a tool for the kitchen, but it can be used to dice and slice a number of ingredients. Chopping onions: You can keep from crying when chopping onions by chilling or freezing them in advance. Running the kitchen vent or fan while dicing also helps. Check out Wil Fulton’s entertaining take on other tried and false chopping tricks. Spice level: Feel free to ramp up or tone down the spice level of your chili depending on your audience. You may have made Texas Chili for adults originally, and intend to serve walking tacos to a group of young’uns. Tone down the spice level by adding sour cream, yogurt, tomatoes, and or a little milk. 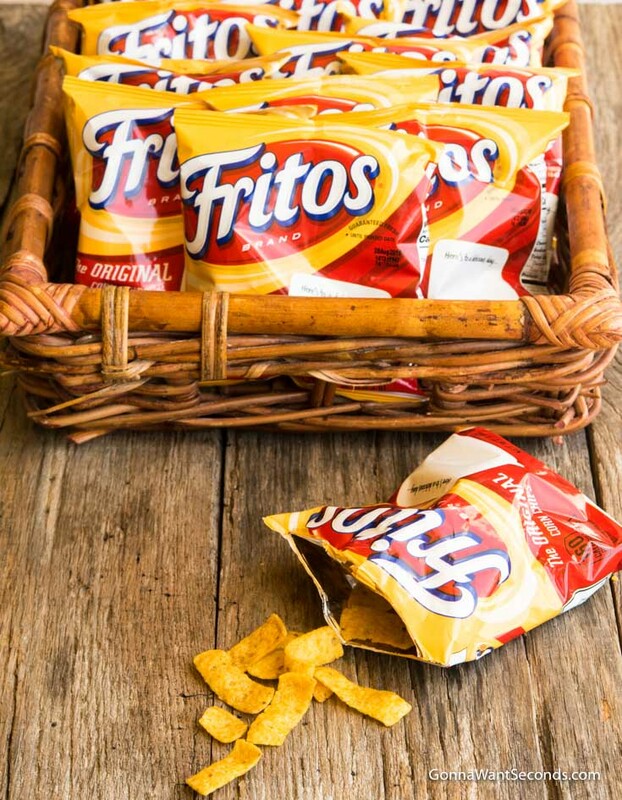 Frito substitution: If you don’t have Fritos on hand, or one of your diners has an unusual Frito aversion, Doritos, Tostitos, or another corn chip varietal will do the trick as well. 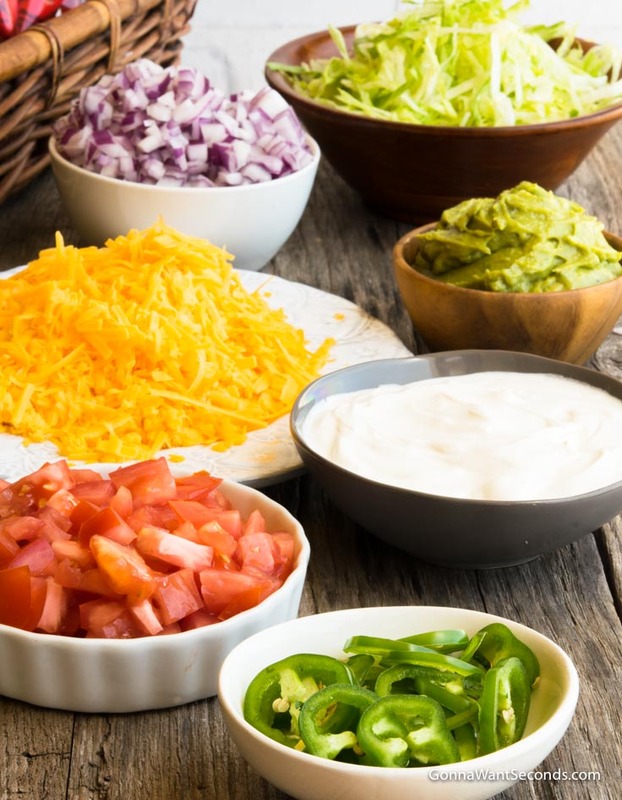 To make a walking tacos bar, set out bowls with your family’s favorite toppings. I like to provide a few varieties of shredded cheese, some guacamole, finely chopped onions, shredded lettuce, and sour cream. Set up your crunched Fritos on one end, sitting them upright in a serving tray. Next comes your big bowl of warm chili, followed by a line of small topping bowls accompanied by serving utensils. Your guests or family simply walk down the line, preparing their taco bags. What to serve with walking tacos: in addition to a refreshing beverage like freshly squeezed limeade or chilled sparkling cider, walking tacos go great with more mellow sides like green beans and fruit salads. I recommend using my Texas Chili recipe. 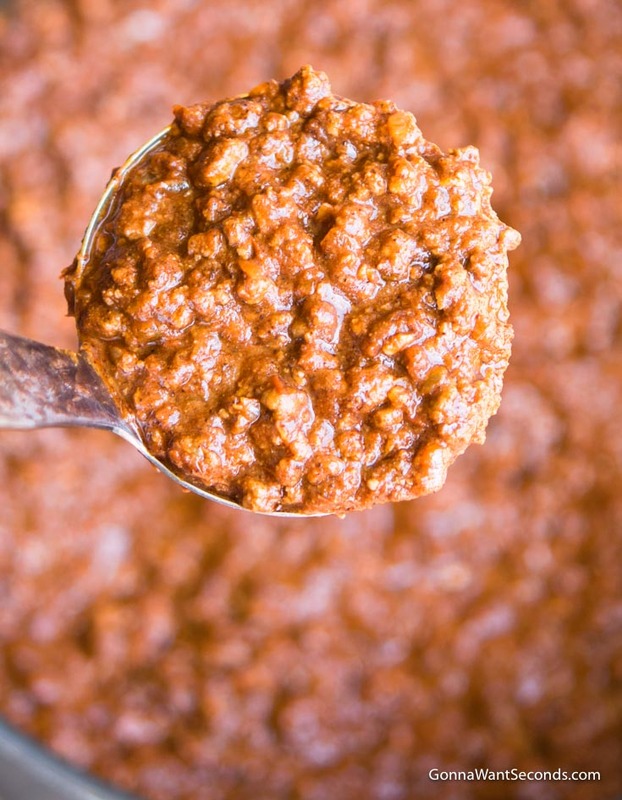 This type of chili was originally used in the creation of walking tacos. Turkey Chili is another alternative that will work just fine. Turkey Chili makes one pound of turkey taco meat, and the recipe can easily be scaled for whatever sized group you need to serve. The recipe employs a great spice combo, no seasoning packets required! Your third chili option is canned chili. While a homemade foundation is always more delicious, sometimes time constraints get the better of us all! Canned chili could enable you to feed a larger crowd or serve walking tacos on short notice. Alternatively, you might opt to cook a pound of ground beef with a packet or two of taco seasoning instead of homemade or canned chili. Just brown the beef on medium heat, crumbling as you go, and adding the seasoning to taste. The primary ingredient in walking tacos (chili or taco meat) can be made ahead of time—even well ahead of time if you choose to freeze it. Chili will keep for several months in the freezer. For a flexible serving time, keep pre-made chili warm and ready to go in a crockpot. You can also set up your topping bowls a few hours in advance, cover them, and refrigerate. Drip a little lemon juice on the shredded lettuce if you are worried about browning.